The first time I met Susan Bradley (at the second-ever SMB Nation conference), she was wearing a shirt that said "I'm Blogging This." Boy was I wrong. Susan was born to blog. But last year I met someone who makes a living blogging . . .
We recently made two small adjustments to our Blog Roll. I feel bad that I can't list all the great blogs out there. So I try to list the ones I try to keep up on. Recently, the MS EMEA blog disappeared. I left it up out of respect until it got old and started to smell like flamunda cheese. Eventually it had to go. And that left room for me to add someone whose blog I've been following for quite awhile. And when I thought about it, I realized that this blog definitely belongs on the roll. The MSP Mentor -- http://www.mspmentor.net/ -- is brought to you by Joe Panettieri and the Katz over at Nine Lives Media. When you see him at a conference, he's either running a seminar, blogging, or uploading video with his phone. And there's something sticky about his blog. It gets a lot of comment and feedback. It's a real two-way conversation. Best of all, Joe's blog never gets hijacked by the comments because he keeps posting new stuff. So lengthy discussions eventually just flow down and off the page. All in all, a good mix. Check out MSP Mentor today! Note that Joe also runs The VAR Guy blog and Works With U, a Ubuntu blog. The VAR Guy is for VARs, of course. And Ubuntu is for real men who write their own printer drivers. I grew up in a car family. I owned (bought and sold) four cars before I had my license, plus the one I owned when I got my license. When you like cars, there are certain cars you love and hate. I hate Fords. No good reason. Just never had a good experience, and I've had several bad experiences. I have brothers who love Fords. Remember, I grew up in the '60's and '70's. Newish cars were huge monsters built for speed. I loved Chryslers and Pontiacs. Older cars were even larger but still capable of speed. My favorite cars of all time were my two '57 Chevys. Fun to drive. Weighed more than our house. We used to go to the recycling yard (then called a junk yard) and get chrome bits and pieces from the Pontiacs and Buicks to put on the Chevy. Even back then, the major differences in these cars was the nameplate. My '62 Pontiac Tempest with the rear-axle transmission was one of the coolest cars ever. Aaaaaah . . . memories. I have driven Hondas and Toyotas exclusively for almost than 20 years. Now, I don't "love" Hondas or Toyotas. I love the fact that they're reliable and affordable. They get the job done. At this point, I could drive anything I want. But my wants and desires can't be fulfilled with a car. So I have a plain, dependable, average car. Now comes news that Pontiac, one of the greatest brands for the last 100 years is going away. My emotional side is sad. A great brand. Great advertising (at least in the 50's, 60's, and 70's). Great images. Great cars. But my "business" side - my intellectual side - has had me driving Hondas and Toyotas for a long time. Maybe long enough to drive Pontiac out of business. People - and businesses - need to make decisions that are sound for their bottom line. If you're selling "cool" you better stay cool. iPhone comes to mind. But if you're selling solid, boring, reliable, you better deliver that as well. In the end, Pontiac is no different from the other American brands that ignored the signs of the times. For thirty-five years we've needed small, dependable, fuel-efficient cars and American car companies have been giving us humongous monster mobiles. As technology changes, you have to decide what you're going to offer your clients. Will it be a brand new dinosaur or the technology of the future? Over time, "rational" business people are going to make buying decisions that make it more and more difficult to live in the past. They may not be on the cutting edge, but when the standards move, they'll move. I'm sorry for Pontiac, but I made a series of decisions that were right for over the years. And they never offered up what I was buying. Your clients are the same way. They'll make decisions that are right for themselves. Hope that bodes well for you. Visit www.smbbooks.com for SBS Books and more! A Note from our friend Stuart. As you've seen on the blogs, HTG Summit just concluded in Dallas. In addition to working on our own businesses, members explored the future of our industry. Stuart helps us look into the future a bit . . . IT Thought Leaders Converged on Dallas. Will it ever be the same? Small Business IT Thought Leaders and Industry Experts recently invested an entire week to focus on the growth of their businesses. The Heartland Tech Group movement founded by Arlin Sorensen in 2001 as a purchasing group just finished their first annual HTG Summit where over 300 partners gathered in Dallas. Want to know what came out of it, well tuned into Small Business IT Radio on Friday, May 1st 2009 to learn how the cloud will impact your managed services business, what disruptive technologies are on the horizon and how will your business change because of it. How important is marketing and sales to a managed services provider these days? What about financial benchmarketing, why is this important? HTG brings together IT partners from three countries quarterly for in depth, highly focuses and stressful (in a good way) business development and growth focused peer groups that hold each member accountable for the success and challenges in their business. Tune in Friday May 1st to learn more, showtime is 12 Noon Eastern/9 AM Pacific Time - tune into http://www.blogtalkradio.com/smb/2009/05/01/Thought-Leaders-Converged-On-Dallas. Hosted by Stuart Crawford from Bulletproof InfoTech in Calgary, AB, Small Business IT Radio is a weekly program geared on providing valuable business information to managed services providers, IT Professionals and business owners throughout the globe. Tune into http://www.smallbusinessitradio.com to check out our archives. And of course find out more at www.varvid.com. Aaron runs a VAR called Hardlines in Bellingham, WA. He also produces internet-delivered video to organizations that run the gamut from the Fortune 500 to nonprofits, and even down to high school graduations and basketball games. If you need help delivering video on the Internet, Aaron's your guy! This includes live streaming, streaming video on demand, or creating viral content via sites like YouTube. If you've attended more than two conferences in the last two years, it's a good bet you've run across Aaron and his crew. Join us May 6th to discuss how you can use video in your business -- both as a marketing technique and as a revenue stream. See examples of his work at . . . There are events in life, and in business, that bring dramatic changes that echo for years. The "Dot Com" boom and "Dot Bomb" burst is such an event. Everyone who was in business then felt it. This current recession is another such event. Not just because sales are down for many people and will go back up when it's over. There are several rivers of change that are all coming together at once. I believe this recession will be seen as a trigger that forced many other changes to take place all at once rather than waiting to happen naturally. It's a fact in politics, society, and business that there are certain triggering events that lead to massive changes in many areas. In "normal" times, people have ideas, start working on them, build prototypes, get money together, and try to sell their stuff. Sometimes they have visions for change. But when a major event occurs, many of these normal people and businesses see it as an opportunity to push much faster changes in their operations. They wait for just the right moment to push change. And if the triggering event is big enough, then lots and lots of people push bigger and bigger changes all at once. At the same time, there are businesses that "survive" by responding to the changes around them. At the small end of the scale, this might mean reducing inventories. Or changing processes to run a leaner operation. From a larger perspective, thousands of individual companies cutting back and running leaner has a massive effect on overall market environment. When this kind of disruption goes on for a couple of years, everyone is affected. And when spending starts up again (you can only be super-lean for so long), businesses will NOT buy what they were buying two or three years before. They'll buy into newer offerings that make them future-proof. When the period of change settles down, there's a new normal. The big winners before the change are not likely to be the big winners after the change -- unless they worked to formulate the future. When I look around, I can't see the future. But I can see people and organizations that represent the future. My friend Erick Simpson sent me a copy of a great book: The Big Switch by Nicholas Carr. Read it. There's a new world of computing coming. And it's coming pretty fast. In this world, computers as we know them will become very rare. After all, most companies don't even need real computers today. They are just used to the way things used to be. If your clients store their data at an online service, use hosted Exchange, hosted QuickBooks, and Salesforce.com, then they don't really need computers. Really. If you sold them a thin client with Windows CE, they would have Internet Explorer and could do everything they need to do. Imagine an office filled with thin clients and no servers. They exist today. And what's the maintenance on thin clients? Zero. They cost $250 to replace. Why would you fix them? Where does that leave you in the future? Will you be the "trusted advisor" telling your clients to stay in the 20th Century? Or will you help them move to their inevitable future? For a taste of what your future looks like, consider this. Appliances will be everywhere. Online services (connect to the Internet and it's there) will be ubiquitous. Computers will be replaced by appliances. I can foresee an Exchange appliance, a SQL appliance, a SharePoint appliance, etc. Most clients will experience thin clients on their desktops and a monitor. Period. Line of Business applications are moving to the cloud. A few dinosaurs will put this off as long as they can. But they're going to either learn how to do it or find that their quick and nimble competition has figured it out and taken their customers. So one "cloud" is out on the Internet. But let's say that you're just as interested in the deep technical dive as you are in the consulting side of business. You can build your own systems. You can host Exchange and SharePoint. You can create virtual desktops. You can backup client data to your colo facility. Many clients with sensitive data are not ready to dump it all out "there somewhere" on a cloud. But they might be very willing to have their systems hosted on your servers. So your company will have a small-size cloud for your clients. You will be a regional utility company in the age of utility computing. So a second "cloud" will be one you build and manage. - Your opportunities are to provide hosting services and opportunities from the colo to the so-called desktop. Services will be designed specifically for you to generate revenues in this environment. You will need a high skill set to maintain and manage the servers and services you offer. But what about those die-hard clients who just want to touch and see and feel their data? Well, with services like the BoxOffice from Zenith Infotech, your client can have his own little cloud in his own office. One or two devices will house all the servers and all the workstations, plus the backup (pushed off site to your colo). Thin clients will deliver computing to the desktop. So the third "cloud" will be a tiny client-owned cloud. - Your opportunities are to manage all the stuff at the client's office, but 98% of it can be done remotely. Just be aware that last option is just a transition to the next phase. There will always be a few wild clients living "off the grid" in Idaho, using bio-diesel generators to run their own servers. But just like electricity, essentially everyone will get their computing power from large computing utilities (Microsoft, Google, etc.) or the local/regional computing utilities (potentially you). - Imagine how scared Ingram Micro and Synnex are about the prospect of massive cloud computing and utility computing. When 90% of today's computers are gone, who will buy equipment? Big companies that buy direct. - If servers get replaced every 3-4 years and the last of the current generation will go in this year and next, that means our current model of computing will be gone by 2014. You'll have stragglers and specialty computers. But everything else will be gone. - This all requires serious bandwidth at reasonable prices. We've been getting there very slowly in the U.S. Within five years we should be there. - At the client end of things, consultants (advisors) will get premium salaries. Why? Because you have to get this right or the client is screwed. At the client end of things, appliance repairmen will either be commodity jobs (see refrigerator repair) or non-existent (see DVR repair). - It's also possible that this watershed will take a chunk of clients, or a few businesses, but that we need to wait for some other significant social event to sweep the rest of the world into utility computing. So you may get an additional five year delay in there somewhere. But don't think for a minute that you can avoid the future. Just a few thoughts to lighten your day. Managed Service Challenges in This Economy - Join Us! Erick Simpson and I are putting on a webinar for the Microsoft West Region PCM team on Friday 4/24 at 10:00 AM Pacific. We're going to have an hour of "material" but we've scheduled the webinar for 90 minutes so we can take all the questions that come up. We're going to talk about . . .
- Which Managed Services organizations excel? - What are the gotchas in Managed Services? Erick Simpson is the author of three books on managed services, ran an MSP for many years, and is now the VP at MSP University. Erick is a popular speaker and trainer at events all across the land. Karl W. Palachuk is founder and CEo of KPEnterprises Business Consulting, Inc., a managed service provider and (Sacramento's Microsoft Certified Partner). 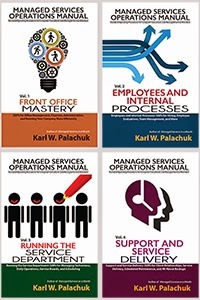 He is also the author of several books, including Managed Services in a Month. 10:00 am to 11:30 am PST. BTW, if you're in the West Region and want to get in on a lot of good information and training, be sure to email suzl@microsoft.com and she'll add you to the notification list for the every-Friday meetings. I had another one of "those" conversations with a partner last week. His clients owe him money and won't pay it back. At least not quickly. "Other than that, he's a great client." Wait. Stop. Other than not paying you he's a great client? Huh? I'm sorry. I thought you said that other than paying you for your work, he's a great client. What can that mean? [Sometimes our "personal" relationships with our clients are a sort of mental illness. How else can you explain that someone owes you thousands of dollars and you find yourself making excuses for him? Let's take a deep breath and look at what you know is true even though you're trying really hard to lie to yourself. Either get over the feeling of guilt about taking money for what you do or close your business and go to work for someone else. To make a profit, you need to use money wisely. It is naive to think that business consists of exchanging dollars for hours. Why? Well, some people don't pay at time of service. So, some portion of the money owed to you will never show up. It might be 1% or 2%. It might be .01% but it's not 0.0%. If you've been in business for a few years, you can calculate how many dollars will never show up. It's a generally reliable percentage. But it's different for every business because we all have different policies about collections. The tighter your policies, the less you lose. Think about those last two sentences. I can't predict how much money you'll lose as a result of your policies. But I can assure you that the primary variable is YOUR POLICIES. When you decide to change your policies, you'll lose less money. There are two principle ways that you give away money whenever someone does not pay in advance. First, there are some losers who never pay for whatever reason. Luckily, these are rare. Second, there are people who delay and delay and delay. So you lose the use of their money. You might borrow money to pay your bills during this time. You might give them a discount just to get them to pay their bill! So they get to claim "I pay my bills. Nobody ever lost a nickel on me." In the meantime, you're paying interest on the money you borrowed because they didn't pay you. If you want to be in the profit-making business, here are some realities you need to deal with today. 3. If you pay down your balance on your credit cards, chances are good that the CC company will reduce your credit! In other words, credit is tight. Let's think about our capitalist roots for a moment: Supply and Demand. If money is hard to come by and your clients want money . . . the most obvious thing you can do is to charge them for it. In other words, if you are going to get into the money-lending business, now is a great time IF you're willing to charge Interest !!! If you want to make money, you need to put in place some common sense policies like those used by 99.9% of all businesses in the world. Consider what would happen if you stopped paying . . .
Now, each of these has a different time table. Some will cut you off on day one. Some won't realize what's going on for three months. But ALL of them will charge you late fees. And all will charge you interest. And all of them will eventually cut you off. And when you're all straightened out and flush, what will happen? Some will bring you right back onboard because they have no institutional memory. Some will make you put down a deposit. Some won't take you back at all. Some will flag your account to make sure you get the next round of price increases. In other words, there are consequences for not paying your bills. Why are your clients not subject to these consequences? They have to pay their rent on time. And their internet, and their phone bill, and their Tivo, etc. The only people they don't pay on time is YOU. Why? Because when money's tight, people make strategic payments to reduce late fees and service charges. I am free to call your customer a loser because I don't know him. But chances are, he's just another businessman taking advantage of the resources available to him. A few weeks ago one of my oldest clients decided to sign a deal to buy a new server. - Hardware and software must be paid up front. - Hardware and software are ordered from suppliers after we receive payment in full. - Project labor is invoiced each week as worked. Net 20 days. - - except flat-fee installs, which are invoiced with the hardware and due in 20 days. - On the day an invoice goes "late" there is a $25 late fee assessed. - All unpaid balances incur services charges of 1.5%/month (18%/year). - Each Monday we review accounts. Any account with $500 or more in unpaid invoices is put on hold and all work suspended. Well, this client was signing a deal for just under $20,000. So he asked whether we would take 50% up front on the hardware and software. Well, then, how about hardware now and labor when the job's done? I spent a few minutes explaining why we have to operate as we do. For example, If I send people out to work now and don't get the labor payment for six weeks, I'll have generated three paychecks before I get the money to pay my employees. "Okay." He said "I'm just trying not to dip into the $2 million line of credit we have at the bank. We need the cash for our busy season." No hard feelings. It's just business. He has to ask. I have to say no. When you're spending money, you need to use other people's money as wisely as you can. If you can borrow a little here or there interest-free, and it helps your cash flow, you should do that. And your client should do that. There's nothing going on but business. Your clients are probably very much like this. They're just trying to do the best they can with the financial resources available to them. YOU are one of those resources. Did that happen to you or did you choose to do that? Most partners I talk to find themselves "stuck" because they've just let this happen year after year and they don't see a way out of it. To paraphrase T.S. Eliot: The way out is the way in. You got here one step at a time. Retrace your steps. We can all use more cash, right? Especially now. Cash is the air of business. You don't last long without it. Service businesses -- especially service businesses that also sell tangible products -- get caught in cash flow crunches very easily. There are regular, definable flows of money OUT of your business. See the list above re: rent, internet, etc. Add payroll to that and the picture gets real big real fast. But income is less "guaranteed" than outgo. Even if you have a good base of regular recurring revenue from managed services, there's still project labor and hardware/software sales. The bills come due when the bills come due. You pay for some things outright. Credit cards come due. You cannot simply wait for the money to come in! Stop. What's that I hear? The faint voice of experience saying that you've always just waited for the money to flow in AND it always has. We live in an expanding world of technology. There are always more clients, more hardware, more software, and more fun toys. As long as the universe keeps expanding, you'll always be able to borrow from your own future to pay for today's bills. Then the world contracted a bit. The bills flow in as they always have. But where's the new work you were supposed to get? Now more than ever, you need to squirrel away cash to make sure you have the money on hand when needed. If you're in the I.T. business, so get out of the banking business. Use other people's money wisely. And be wise about how other people use your money. Okay. Enough beating you over the head. Let's get on the road to recovery. First, what are your current policies about money? You can't say you don't have any. You do. If Jane Client calls you today and wants to buy a laptop, what are your policies? What's your policy on Hardware and software? What's your policy on Project labor? What's your policy on Managed Service payments? What's your policy on late fees? What's your policy on interest charges? What's your policy on bounced checks? and so forth. What do you do? That's your current policy. Write it down. Second, where do you want to go? What do you want your policies to be? Once you've written down the "old" policies, draw a big line across the paper and write "Beginning June 1, 2009, the following policies will be in affect." Then write out where you want to be. Now, tune it up a bit, print it on letterhead, and send it out to all of your clients. Add a summary of these policies to the bottom of your quotes and to the bottom of your invoices. Really, honestly. Just do it. The difference in your business will be dramatic. You'll get money in hand before you order the hardware. You can pay cash if you want! And a project that should be good news and bring money flowing into your business won't throw you into a panic about how you're going to make payroll when you've got $10,000 worth of new bills to pay. Get one really good thing out of this recession: Healthy cash flow! Note: If you decide that you really don't need to be paid in advance, or charge interest or late fees, and that you're willing to let people pay you back when they get some free spending money . . . PLEASE contact me. KPEnterprises would like to replace the carpet in the main office. We could use some free money. And we might do some more advertising too. We need money for that. In fact, if a thousand readers each loaned me $1,000 and let me pay it back when I get around to it, I promise I will. We could do a major expansion if enough of you will just give me a loan with no strings attached. Don't worry. No one's every lost a nickel on me! I finished all my preparations for my HTG peer group meeting this week. I'll be heading to Dallas on Tuesday. I won't say the hard work is over, but the part that takes "preparation" is over. HTG (Heartland Technology Group) members are often asked what we do in our meetings. Rest assured, there's no great conspiracy going on here. We're just helping each other take over the world! HTG Member One: "What do you want to do tonight, Brain?" HTG Member Two: "The same thing we do every night, Pinky: Try to take over the world!" And how do you go about taking over the world? Well, there's a lot of work involved. It starts with a realistic evaluation of what your company is doing today. how do you operate? Are you making money? Are you making enough? We share with each other our standard operating procedures. Now, we're not all geniuses, but collectively we see the stuff that works and the stuff that doesn't. Every once in awhile someone will "I'm changing our procedures on Monday." There are plenty of Ah-Ha moments. We talk about how we get new clients, how we market, how we hire and fire, and how we do just about everything else. Now, truth be told, if you've attended a few conferences, you've had these kinds of conversations in the hallways and at the bar. But this is different because we dig down an extra layer or two. Rather than a conversation about "How do your find clients?" we dig into specific techniques. We share forms, marketing materials, costs of acquisition, and success rates. And we share our failures. At the bar, you'll hear success stories, but rarely the failures. "Oh, yeah. we dumped $5,000 into a campaign that went nowhere." But we DO share such failures because we're all working to help each other replicate success and avoid failure. It is an environment in which members can safely ask for help and share their weaknesses. A surprisingly large amount of success consists of recognizing and analyzing failures in order to improve. We talk about trends and standard practices. We share tools that make us more successful. This ranges from the "biggies" such as Zenith and Autotask to the little things we use at point of service, such as DNS Stuff and EventID.net. At the end of each meeting we set company goals for the next three months. We begin the next meeting my reviewing these goals and seeing who did what. We help each other to be accountable for the goals we set. And while we cover . . .
. . . NONE of these is a casual conversation. Our process is structured so that we give each other the truly useful information (good, bad, ugly) in order to help make each others' businesses more successful. And the relationships continue after the meeting is over. We call each other during times of success and stress. We ask each other for advice and help each other out. Now, do you need HTG for all that? No. Absolutely not. In fact, some people are doing all these things anyway. But having a Peer Group goes a long way toward making sure you do these things -- and are held accountable for doing it. So far we haven't made a dent in taking over the world. But it's a great way to improve our businesses at the local level! Procurement as a Service (PaaS) allows Managed Service Providers to increase profitability and focus on core professional services delivery. Joe talks about how to reduce internal costs, maintain control of the sales cycle, and become competition-proof from direct manufacturers. The call is posted on the SMB Conference Call Archive Page. Aaron is the Videographer to the Vars. or find out more on the SMB Conference Call Page. In addition to being Videographer to the Vars, Aaron helps folks deliver video on the Internet in all forms. See examples of his work at www.VarVid.com. Amy and Eriq are providing escalated tech support for SMB VARs at a swll little company called Third Tier. You should also check out their blog at www.thirdtier.net/blog. As always, we try to find things interesting, informative, and profitable for SMB Consultants. Erick Simpson is working with the LET - Local Engagement Teams -- to sign up more partners. To that end, he's putting on a webinar entitled How Microsoft can help Jump Start Your Prospecting along with "MJ" Murphy from Microsoft. Join the webinar on Tuesday April 28th at 9:00 AM Pacific and learn how to receive up to 5 FREE copies of Microsoft Software to Jump Start Your Prospecting. Are you a Microsoft Partner? If you are, Microsoft will agree to sponsor up to 5 local Chamber of Commerce events at any Chamber of Commerce you choose to work with by furnishing up to 5 copies of a Microsoft Software Package (Microsoft Office, MSFT Streets And Trips, SBA, etc) to you to be used as raffle prizes at these Chamber Events. This is a tremendous way for you to generate leads for your products and services as you collect business cards or registration forms for these raffles! Once again, our special guest will be Michael "MJ" Murphy, Business Development Manager, Microsoft. Together we'll discuss how to take advantage of this tremendous opportunity from Microsoft. All you need to do as a Microsoft Registered, Certified or Gold Partner to receive this benefit is agree to attend each Chamber Event and conduct the raffle of the Office Prize. This gets you in front of local business, demonstrates your relationship with Microsoft and builds your credibility in your local markets - YOU WIN! When marketed with your local Chamber of Commerce, this acts as a hook, creating fresh buzz around the Chamber events and driving attendance - THE CHAMBER WINS! The Chamber helps get the word out about Microsoft software and its sponsorship of the event - MICROSOFT WINS! Wow, I've heard of win-wins before, but this is a 3-way win! Join me for this valuable Webcast to learn how to position this opportunity with your local Chamber of Commerce and utilize Free Microsoft software to increase leads and fill your opportunity pipeline. Of course, knowing Erick, there will be a lot of good content here and not just the details you've already read. So check it out and then start making a list of local chambers! and the topic is . . .
Joe is the Vice President of Axis Business Solutions. They provide Procurement as a Service (PaaS). Their key clients are Managed Service Providers who want to increase profitability and focus on the core professional services they deliver. Joe will share how to reduce internal costs, maintain control of the sales cycle, and become competition-proof from direct manufacturers. Joe is Vice President of Vendor Alliance and Relations for Axis Business Solutions, an expert in technology procurement and logistics for the IT Services and Support industry. Since 2001 Axis has been helping companies in this industry to become more profitable, operationally efficient, and competition-proof. Joe has fifteen years of sales and management experience in the high-tech industry. Prior to Axis, Joe was a key principal in building a service division for a New England-based VAR. The business model leveraged a combination of internal and partnered resources to deliver cost-effective IT solutions. In four short years, Joe helped build the division into a $20 million-per-year business unit. In 2004, Joe also spearheaded and managed a services-delivery relationship on a national scale between a regional organization and a Fortune 1000 company with 1.35 billion in revenues. Joe is a member of several strategic groups within the MSP and IT services industry and Axis has been recently profiled in eweek and Channel Insider. Great Little Book is proud to announce that we are releasing a new book this week. Available at SMB Books and Amazon.com. Believe it or not, I read a lot. A lot. Luckily, I can hide my book budget inside my company budgets. So I spend some money each month from the family budget on books. Plus more via KPEnterprises. And even more via Great Little Book. Among my favorite kinds of books are Quotations. I love to read through quotations and mark up all the ones that inspire some point in my life or work. Well, you can't get very far in Bartlett's or Yale Quotations or Quotationary without coming across some great quotes by Coleman Cox. Cox was a businessman and salesman in the early part of the 20th Century. His quotes cover business and sales generally, with a generally positive attitude toward life throughout. He gave away a few thousand of these booklets. After that he received hundreds of letters requesting multiple copies of the booklet. So he printed a second edition, which sold out before the printing was complete. After that the booklet quickly went to a third, fourth, fifth printing, and beyond. Within ten months, “Take It From Me,” the first booklet, had sold millions of copies. So, in 1922 Cox came out with another brilliant collection of witticisms. Every copy was sold out before the printing of the first edition was complete. It didn’t take long for Cox to realize that these millions of little booklets were being purchased by business owners as gifts for their employees and clients. Because Cox could easily print off small runs, he offered to print up booklets with a customized message in the front. These messages are often quite heartfelt and are obviously written by business owners striving for a better world. We have come to realize that we owe each other some expression for whatever success we have attained and possibly this little book will mean quite as much to you as it does to us. At the same time, although these words are from eight decades ago, they ring true today. Other than the fact that business is no longer completely dominated by men, almost nothing here is outdated. I’m sure you’ll find a great deal to enjoy here. And you’ll be quoting Coleman Cox for a long time to come. You never hear a busy man complaining about his lot in life. It’s always the loafer who does the kicking. The surest, quickest and best way to disrupt an organization is to put a few personal friends and relatives on the payroll. Walk fast. A fire department looks just as much like business when answering a false alarm as it does when going to a real conflagration. Suppose you were your employer, would you keep a man on the payroll at the salary you are getting for the work you are doing? You are paid for doing what you are expected to do. Increases come from doing more than is expected of you. When you get an order without an effort it is always a good idea to consult Mr. Dun or Mr. Bradstreet before making shipment. Too many men looking for work quit looking for it when they find jobs. The best time to get another order is right after you have gotten one. What you don’t know won’t hurt you. But I get tired listening to it. While the optimist is seeing the future, and the pessimist the past, is a good time for a real salesman to get out and see prospective buyers. Open to any page right now and you'll find yourself flipping through several more. This book is a wonderful resource you'll come back to again and again. And, of course, this little book makes a GREAT Mother's Day or Father's Day gift. Or a great graduation gift. Buy two. One for yourself and one for a friend. This is the third and final post on BEST Best Practices. The others are here and here. The thing about "best" practices is that they need to habits (practices). For example, you can buy a PSA system. But if you don't use it, you might as well throw it away. The same is true with buying Robin Robins' materials. If you buy them and sit them on a shelf, they're useless. I knew someone who once bought every single product John Maxwell had for sale. Thousands of dollars. Probably over $10,000 all at once. They were all neatly shelved and in perfect condition. Thousands of pages of material. Dozens of books. Hundreds (thousands) of hours of audio CDs. All unopened. Perfectly new. Perfectly clean. Perfectly packaged. As Mark Twain said: "The man who does not read good books has no advantage over the man who can't read them." Once you acquire a tool or a habit, you set the base for your future success. But if you let it go unused, then it does you no good. So learn your tools. Sharpen your habits. Practice until you really know your stuff. Eventually, you will use the tool to its fullest extent and the habit will become part of who you are. After reading the first ten items, this shouldn't be much of a surprise. A good PSA system will help you run your business. It will give you the tools you need to keep track of clients, employees, jobs, and processes. In terms of other best practices, the easiest way to keep scope creep to a minimum is to put every single activity in the PSA system. The easiest way to keep your company from being interrupt driven is to only perform work from a service request. Again, that means inside the PSA system. And a great place to get started with key documentation is inside your PSA system. If nothing else, key passwords, configurations, and imported documents will do amazing things for your documentation. If you don't have SOME system, it's time that you got off the fence and made a decision. Even if you need to rename and re-brand your business, you should pick a good name and go with it. Please see the post What's In A Name? If you want to charge top rates, be taken seriously, and make it easy for people to give you referrals, then you need a good name. Granted, it's hard to come up with one more name that got words like cyber techno chron. And adding guru or wizard just makes it worse. - Cyber Techno Goober Gurus? Not to beat a dead horse, but I don't want to hire the Lawyer Wizards to represent my company. I don't want the Plumbing Guru to magically fix my pipes. And I don't rely on TechnoKron Marketing Zolutions for my marketing. Assuming you've moved out of your parents' basement, it's time to have a good, grown-up business name for your business. One of the saddest things I see is consultants who are never "off" work. They don't know their wife's favorite TV show. They miss major events in their childrens' lives. They don't have a hobby. Even if you love you job -- and most of us do -- you have to NOT WORK sometime in order to create balance. You can't balance work at work and work at home. Those are both work. You need to draw lines around your business and keep it inside the lines. This can be difficult with a home office. But you need to "clock out" and go do something else. Close the door and be home for awhile. We've seen people get sick from working too much. We've seen nervous breakdowns, heart attacks, and stroke. If you don't take care of yourself and bring balance into your life, no one else is going to do it for you. This also loops back to the central point FOCUS plays in your success. If you work while you're at work, you'll have more time to play when you're home. If you can avoid being interrupt-driven at work, you can save all the little fun stuff to share with your family. I have a whole business dedicated to this, so it's obviously a passion for me. Please take a little time to check out Relax Focus Succeed. It could save your life! One of the reasons I rarely reply to technical posts on the message boards is that I have very little patience for people who are in this profession but are clearly incompetent. In fact, there are some people who are so un-professional and incompetent that they don't know how incompetent they are. We've all cleaned up after these people. The software's illegal, the server's registered in the old consultant's name, nothing's written down, SBS was somehow installed without a single wizard. I know everyone has to start somewhere. Why not start by learning your job before you go out in the market and sell the wrong thing to a client? And I don't just mean technical competence. That's the minimum. There's also a level of professionalism in how you communicate with your clients and employees. We often get involved in something because we're interested or we want to make money. Nothing wrong with either of these. But neither of them means you're any good at something. I'm interested in lots of things that I'm no good at. And the world's full of way to make money that I'm no good at. If we are motivated to do something without being motivated to learn something, then we simply can't do it well. There was a time when a human being could know everything there was to know about the Internet. Really. And it wasn't that long ago. But now you have to make decisions. You cannot sell yourself as being the expert on all things technology. You're not the Professor on Gilligan's Island. You need to a few general topics (e.g., Windows desktops) and a few specific topics (e.g., Small Business Server) and learn those things really well. Specialized knowledge is always more valuable than general knowledge. For example: My company doesn't sell Microsoft CRM. We've loaded it. We've looked at it. But we decided that we don't want to spend the time and energy to LEARN it. You need to learn it to sell it. You need to learn it to set it up. You need to learn it to fix it. There's a commitment there. Now, are there any great mysteries in CRM? No. We're technical. We could figure it out. In fact, we could master it. But we've decided NOT to master it. And we don't think it's right to charge our clients so we can "figure it out." Many people get into this business because it looks easy. "I know about computers. I know about the Internet. The cost of entry is low. Everyone who's not a computer consultant thinks I'm a genius. I think I'll do that." Well, most technical consulting isn't about technology: It's about business. The technology changes every month. So the challenge to being a good technical consultant is to keep up on a small subset of "technology" and provide the right solutions to clients. And you can't be competent at everything. But you better be competent at the job you claim to do best. Part of the business side of business is to look ahead. What's coming? What's next? And what's after that? Why do this? Well, it's quite simple: If you're going to be around then, you need to be prepared for it. Every day of your business life, you get to choose whether you'll simply Respond to the World Around You or actively Work To Build Your Future. Time will proceed at exactly one year per year. You can spend that year responding to the world like a pinball in a machine, or you can take control of your business and move it in the right direction. When you look into your future, which of these technologies are you looking to deploy? Next question: What are you doing about it? If you're "betting" that virtualization will have no significant impact on the SMB market, then what's the alternative? If the answer is HaaS, what are you doing about it? You need to think about all these things, and how they affect each other. You need to make choices about which technologies you'll embrace and present to your clients. In the year ahead, you will have to allocate time and resources to learning the things you want to sell. How will you educate yourself and your staff? How will you learn to sell these things? Who will your partners be? Way too many people simply continue doing what they do until they can't do it any more. None of those people charge the highest rates, have the most loyal clients, or thrive as a business. They simply continue to exist. They continue to ask how to get ahead but never take any action. They show up for user group meetings -- sometimes -- but nothing ever changes. They don't consciously choose what their business will look like. As a result, they get whatever scraps drop from the table. As Brian Tracy would say, "This is not for you." Set a course for your business and follow it. Yeah. You might be wrong. The most successful people I know fail really fast and move on the next thing. I fail at some initiative at least once a quarter. But I keep moving. I might be completely wrong about the future. But the process of thinking about it makes everything work better. Somebody in your company has to have the job of thinking about the future. If it's not the owner and the general manager, who is it? Some days I just get excited about all the fun things I get to do on my job. I don't have a job description you find in the newspaper. It's more of a job description you build by working really hard to build a business that's designed to make you happy. The world is a better place because I don't Twitter. We have three announcements from the world of SMB Books. First, we now accept American Express for online sales. Oddly enough, we went through a long process to make this happen in early 2008. And I thought we were done. Until last week when a seminar attendee complained about it. We got to the 1 yard line. But I fumbled. So, if you've been avoiding SMB Books because we don't take Amex, your long national nightmare is over. In fact, we've decided to have an American Express Sale. Use the coupon code AMEX09 and receive 5% off any order. No minimum. You don't have to use an Amex to use the code. Expires May 31st 2009. Anyway, pull out your plastic . . . and sign up for a seminar while you're at it! Second, SMB Books will soon be mailing out our first ever COLOR catalog. We are very proud of it. Don't miss your copy. About a thousand of you are on our email list but not on our physical mailing list. If you have NOT received a postcard from SMB Books in the last six weeks, that means we don't have your mailing address. Go right now and sign up: Sign Up Here. We won't sell your name or address. We won't rent out our list. We won't fill your mailbox with crap. But we WILL send you a great catalog. Don't miss out. Sign up now. Third, SMB Books has officially inked a deal to be a sponsor at SMB Nation - Fall Conference 2009 in Vegas. October 2-4. Since we will soon have a new book on Migration Strategies for SBS 2008 (and SBS 2003), we are holding a major seminar in Vegas on October 1st. PLEASE plan to arrive a day early. This seminar is all day (9:00 AM to 5:00 PM). Yes, it costs serious money. But there is a 100% guarantee that you will save or make at least One Thousand Dollars by using the migration strategies we present. Sign up at SMB Books Seminar Page. And don't forget to use the Amex09 code to save 5% right now. Put it on your Amex! And we'll even send you a free color catalog. 1) It's good to be me. 2) I love what I do. 3) I do what I love. And thank you to the entire community for making it possible for me to enjoy my job every day. A few days ago I posted the first five Best Practices. Here's the next five. Again, in no particular order. If you're a regular reader here, you will have noticed that you've seen these topics in some format before. After all, these are the key things that I believe make our company better at what we do and help us reach our goals. In addition to money, our goals include a nice working atmosphere with good clients and good employees. Some people will argue that small businesses should not have a formal "big business" hiring process. But that's absurd. What's the alternative? Really, what's the agrement for not having a good process? I outlined the process we use here. Basically, any real process is better than no process. You don't have to have a big, complicated system. But you need to have something. Hiring the wrong employees can destroy your business. Anyone who has hired more than three people has probably made a bad hire. Any process that helps you avoid a bad hire is worth doing. Erick Simpson has a great discussion of the hiring process in his Service Delivery book. If you've attended any of my seminars in the last two years, then you know that the most important money-saving phrase ever invented is "That's outside the scope of this project." Most consultants never learn to say this. I don't know whether they're shy or just let the client call all the shots. The basic problem is that you estimate a job based on the work you know about. But once you show up, the client adds a little job here and a larger job there. I really fell for this one time early in my career. I showed up to do a simple job. But the client had brought in a home computer. He'd screwed it all up, added a drive, messed up the cables, etc. It took a couple of hours to fix. Happy client? No, of course not. "You estimated three hours to set up our email, but it took you five. I'm not paying for this!" We argued. We settled. And he was the first client I ever fired. I believe the letter said something like "You need to find a consultant whose approach to technology is more consistent with your own." Which really means "You're cheap and I insist on being paid for the work I do." 1) "That's inside the scope of the project"
2) "That's outside the scope of the project"
The truth is: I've never had a client argue when I said "That's outside the scope of the project." I don't say I won't do the work. We simply create a NEW service request for the new project. That way, you can log time against the original service and then put all the add-on labor to the SR you added on. This is a MAJOR sticking point with many companies. A PSA system will help tremendously. But you have to learn it and use it. One of the key rules for success here is that All work is done from a service request. So, no matter what the client comes up with, you simply create a service request. The original job is paid for via the original SR. The new work is paid for via the new SR. Awhile back I told the story of our regular staff quizzes: See Quick Quiz: What do we do and how do we do it? How often have you heard that you need a 30-second "elevator speech?" Make that a little bit more difficult and a LOT easier: Create a pitch that's five seconds or less. What do you do? "We design, build, and support Microsoft networks." After that one-sentence statement, let your employees fumble through the discussion. The goal here is to give them a gold first sentence so the response is exactly the same every time from every employee.
. . . And you'd be amazed at how difficult it is to burn that tiny little phrase into someone's head. Monday (three days ago) we did our quiz. For the first time in TWO YEARS, everyone on the technical team got it 100% correct. Remember that. You team does tech support and administrative support. They do billing and sales. But 99.9% of the time, they don't think about marketing your company. As with any other muscle of success, you need to exercise the marketing muscle. Develop a unique selling proposition. Perfect it. Practice it. Know it. And make your staff learn it. Do not make this complicated. Define one-sentence statements. What do we do? How do we do it? There are at least 60 opportunities to be interrupted every hour. At 8 hours/day, that's at least 480 opportunities. But when you combine the telephone, email, shoulder-taps, blackberries, LinkedIn, Facebook, instant messaging, and 1,000 other things, you don't have a chance. Unless you make it a habit to NOT be interrupt-driven. You don't have to answer the phone just because it rings. You don't have to check your email all the time. It is critically important that you focus on the job in front of you. Consider the things that just pop up. Is that IM more important than the job in front of you? Probably not. Let me make that 99.9% probably not. I love technology. But you really need to keep it in it's place. Every minute of every day you have to choose to either FOCUS on the thing you're doing or allow yourself to be interrupted. But that's really difficult for most of us. The most important moment for your success is the present moment. Every moment of every day you have to choose to either stay on point or do whatever comes up. "Whatever" is not the answer. It takes policies and procedures to avoid allowing yourself to be interrupted. You have to work at it. - Only check your email once an hour. Yes. Really. - Put everything you need to do into your PSA system. Use it. - Prioritize every task. Do NOT do something "next" because it's the next piece of paper on the stack. Back in 2007 I wrote about Weeding Our Client Garden. I also discussed this very thoroughly in the Managed Services in a Month postings. This is a good practice about once a year. The world keeps changing. Clients change. Your business changes. Your products and services change. As all of these evolve, you may find yourself with the wrong mix. As you evolve, your new clientele will evolve. What what about your old clients? Are they still a good fit? Nothing personal, but we're all a bit lazy and complacent. If you have a client who is no longer a good fit, you'll keep them around just because they pay their bills. But if you and your business have evolved, an old client who is a poor fit can be a distraction from your current model. Consider this: We got a call last week from someone who used to buy hours from us. But they didn't meet our revenue threshold. So we gently passed them on to another consultant in our user group. But now they're back. Of course they only want to buy 1-2 hours. So we had to say no. We have a business model and it's NOT built around scurrying all over town to pick up nickels. We're not going to take a consultant away from a client on managed service who has made a long term commitment to us in exchange for one hour of labor at $225. Now, with that in mind: If I have "clients" who fit the model of buying a few hundred dollars worth of labor a year, they fit this same pattern. They distract us from what we're doing. You may have heard this advice about the stock market: If you wouldn't buy that stock today, don't keep that stock today. Well, if you wouldn't hire that client today, don't keep that client today. And this is NOT just about money. In 2008 we fired two clients because they were intolerable to work with. Arrogant, unfocused, unable to plan ahead, and unwilling to work inside the system we developed. In total, these two clients were worth more than $200,000. As a small business, that's a serious hit for us. But there's a lot less stress and anxiety in the service department. Our office is a better place to work without those two clients. Yes, it hurts to give up the money. But, no, I wouldn't do it differently if I had known that the bottom would fall out of the economy. Money is easy to replace. So, when you consider weeding your client garden, consider . . .
- Are they profitable enough? - Are they easy to work with? - Are they interesting or fun to work with? - Do they pay their bills on time? - Do they take your advice? You might create an evaluation form and have your technicians and key people rate each client. But I'll give you a hint: No one will be surprised at the clients who stand out as needing to be dropped. You know who they are; you just need to draft the letter. And don't feel bad sending these clients to other consultants. There are plenty of people who are willing to work with whoever you're giving up. Be honest about the reasons. Then let them go. Warning: Sometimes client are VERY reluctant to go to another consultant. That's flattering, but you need to stick to your guns. One of our favorite business partners is Zenith Infotech. Why? Because they're the future. They represent more than the future of my company or the future of the managed service industry. Zenith is the model for the future economy. On the drive home last night I listened to a bizarre radio interview, speculating what the economy will look like as we pull out of this recession. It was a fairy tale of cheap, fuel efficient cars and kinder, gentler consumers who will not be obsessed with commercialism and crass consumerism. That's not going to happen. But some things ARE changing. For example: The cloud is coming. - I want my data where I know where it is. - HIPAA is meaningless. I want my data. - I don't know the cloud. I don't have a relationship with the cloud. - What the hell is a cloud? Partners like you probably don't know what to do. You've heard Microsoft change their tune from "We're going to steal your customers" to "We won't intentionally steal your customers." In the meantime . . . you ask yourself who owns the relationship. That's easy: If you're charging the client's credit card every month, you own the relationship. If you get a few percentage points on the back end when someone else controls the transaction . . . then someone else owns the relationship. If you resell Own Web Now hosting or other hosting, you pay for services as one set of transactions. And you collect money from clients as a separate transaction. The client doesn't know who provides that back end. As far as they're concerned, YOU do. I've never been a big fan of white box solutions (for example, my clients know that I don't personally filter their email or build my own virus scanning software). But with cloud computing, branding will be important. Microsoft. Google. Go Daddy. [Your company name here]. "Who do you use for hosted services?" "We use [Microsoft] [Google] [Go Daddy] [Cousin Larry's Pretty Good Cloud Computing]"
So why is Zenith the future? First, they're thinking BIG steps ahead of the competition. Ummmm. Wait a minute. They don't have any competition for the product set they're announcing. Everyone else is rushing to start hosting. You know all that stuff people like Vlad have been doing for years? Folks are scurrying to catch up and figure it out. Listen to SMB Conference Call #31. So there's plenty of money there. And a bunch of people will be providing hosted services. - Completely packaged solutions . . . Like SBS 2008 Server and 15 workstations . . . all virtualized, backed up, monitored, and supported for less than $400/month. Just labor alone without the cost of hardware, we would sell this for $1,250/month. Add another $1k for hardware and you're looking at $2,250/month with a gross profit of $1,850. Let's see . . . 36 month contract . . . that's $66,600. Like it or not, that's your future. That's where Akash and Zenith are taking this industry. The funny thing is that they're totally committed to the SMB Space. Zenith has partnered with Aserver in Belgium. Aserver is used to working in the larger space, but Zenith redesigned the product for the SMB/SBS market. My tune hasn't changed on this hosted service topic. You can either resell someone else's solution, host your own, or go do something else for a living. Zenith gives you a way to drop an entire solution at the client's office for a low monthly fee . . .
OR host it all on their cloud. Akash and Clint think the move to the cloud will be swift; I think the move to the cloud will be quite gradual. Listen to my conversation with Clinton Gatewood on SMB Conference Call #34. Whether it happens fast or slow, moving to SOME cloud is in your future - and your clients. I am most excited about the "Box Office" line of products from Zenith. I recommend you consider these products in your solution stack. For more information, see http://www.zenithinfotech.com/boxoffice. And Zenith is putting on a great series of dinner presentations to announce these products. Find out more and register for free at http://www.zenithinfotech.com/register. You could be selling this stuff by August 2009. Last month I blogged about "Best Practices" vs. Good Ideas (see http://smallbizthoughts.blogspot.com/2009/03/best-practice-vs-good-idea.html. That got me thinking about all the really great best practices I've come across. I wonder, What are the BEST best practices? In other words, what are the most important best practices for my business? Unlike some topics, you can't really narrow down two or three key activities that make a consulting business successful. In fact, one of the reasons that growing a business is difficult is that you have to work on a lot of things all the time. You don't have to be perfect at everything. In fact, just working on the right habits is 80% of the battle. A lot of people never try to work on best practices. They allow themselves to be overwhelmed every day by the crush of emails and work that "just shows up." With no planning, no process, and work ON the business, they end up coming back to the same position every day. Their business is like the movie "Groundhog Day." When you do nothing to break out of your current situation . . . guess what? You stay where you are. Here's a shocker. Write stuff down. Every day, at every opportunity, you should record what you do. Document router configurations. Document processes. Document the work you do. Document your time. Everyone knows you need to do this. Well . . . almost everyone. Until a recent conversation with someone at a franchise tech support outfit, I didn't believe that people intentionally failed to write down key information. I thought it was just bad habits and a result of always being in a hurry. But now I know that there really are people out there who think they get job security by keeping technical knowledge a secret. I would fire such a person in a minute. I belong to HTG. But I've belonged to other groups before. I also belong to Robin Robins' mastermind group. And to Perry Marshall's. If nothing else, get together with clients or other technicians you know. Create a group on the Internet. Do Something! A mastermind group doesn't have to share financial information. But what it should do is to give you a "Board of Directors" for your company. It should give you a place to lay out your plans for the future, and force you to justify your decisions. A mastermind group should hold you responsible for creating a business plan and a marketing plan. Even if you've done these on your own, it's still good to get feedback and be reminded to follow them. You have to run your business every day. But don't simply run the business you see in front of you. Run the business as if it had become what you want it to be. For example, hold weekly staff meetings even if there are only two of you. Build an organization chart even if your name is in most of the boxes. Make quarterly reports to your employees and "stakeholders." Use professional letterhead, envelopes, and business cards. Set written goals for yourself and your employees. Do formal evaluations at least once a year. Preferably once a quarter. Create formal job descriptions. Follow them. The more you act like the company you want to become, the more natural it will be when you get there. Function follows form. Get invoices out in a timely manner. Pay attention to the money side of business on a regular basis. At least once a week, review how you're doing with regard to payroll, accounts payable, accounts receivable, invoicing, and cash flow. You don't have to be Silas Marner and you don't have to count your gold coins every day. But you DO need to take care of the money side of business. Finances are not "difficult." They're just different. You absolutely cannot be successful in the long-run if you don't pay attention to money. I've heard time and time again how successful people ran their business into the ground because they weren't paying attention to money. I personally had to stop using a sub-contractor a few years ago because he never sent me a bill. He did amazing work. Very talented. But he never sent the invoice! I guesstimated his labor and billed the client. But he never got paid because he wouldn't tell me what I owed him, even after several attempts. Let's face it: You might not like the money side of business. And you might not be very good at it. But you have to pay attention to it. Your finances are critical to your success whether you manage them or not. Most people attend their first conference so they can learn things. They want to attend the technical track or the business track. They want to attend "best practices" seminars. They want to learn more about the tools they use in their business. But they always that the best conversations are at lunch, dinner, in the hallways, and at the bar. Come for the content. Stay for the people! In other words, they discover that this profession of ours is a lot more than bits and bytes. It's a lot more than formal practices. I wish I had a nickel for every time someone with a need for knowledge struck up a conversation with someone who is having success in that same area. The best conferences I've ever attended are NOT the ones where I learned more about a program or tool. The best conferences are the ones where I came home eager to change my business for the better because I met the right person in the hallway! I hope you think of yourself as a professional. Now it's time to engage in your profession. Your profession is more than just showing up and doing your job. Conferences are filled with best practices about the norms in your profession and the expectation of excellence. No. Conferences are filled to the brim with professionals learning from each other and engaging in a higher level of learning. We all work hard all the time. In many cases, we don't have time to step back and work on the higher level activities that we know will grow our businesses. Conferences provide that opportunity. Even in a down economy, you should attend at least one conference per year. And don't just show up: Dig in! Engage people. Talk about what you do and ask them what they do. Remember: Everything counts. But don't overwhelm yourself. Build the right habits and the right habits will build you. 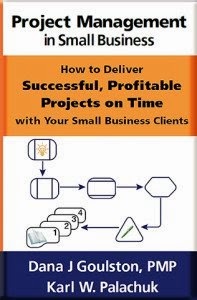 Looking for great books and other resources focused entirely on the SMB Consultant? Visit www.smbbooks.com. Harry Brelsford wrote a great article about the new Microsoft Foundation Server here: http://harrybrelsford.wordpress.com/2009/04/01/windows-server-foundation/. Were you surprised by the new server? If you haven't read about it, check out The Microsoft Announcement. You'll find the official Foundation Server site at http://www.microsoft.com/windowsfoundationserver. 1) The Foundation Server is focused very squarely on the micro-business: under 15 users. As we all know, this group represents the vast majority of small businesses. I'm sure Microsoft will give us the figures. 2) Like Home Server, this one appears to be sold only through OEM. That means system builder, not through licensing and therefore not through the same partner channel that sells all the other Server 2008 editions. For most of you, this means not through you. Harry points out that offerings from IBM and others are emerging as a direct competition to SBS 2008. So one has to wonder, will this product decrease the sales of those potential competitors or simply deplete the sales of SBS 2008? Where Will Foundation Server Fit? As I've mentioned before . . .
(BTW, I want to publicly take credit for the "Biz Server Nano" idea. I only wish they'd used that name instead of Foundation. As I mentioned in one of the earlier blog posts above, there are tiers of technical consultants. The folks who build clustered servers inside Hyper-V are not going to be selling Foundation Server, although they might use it at home. Certified partners in general probably won't sell it because they're having a great time selling SBS to small clients. A handful of system builders (e.g., Dell, HP) will sell it. And probably a whole cadre of independent system builders. BUT what about Registered Partners and very small SBSCs? Will they (you) sell it? Okay. Next question: SHOULD you sell Foundation Server? Here's the deal: Assuming this server is as well thought-out and executed as Home Server and SBS, this really is a server perfectly designed for a specific market. Therefore, it is the right server to sell into that market. You might slice up the world differently than I do, or than Microsoft does. But however you identify the market between "No Server" and SBS, there's a big chunk of businesses that need a server designed just for them. As I've said before, a web server should not be in-house in such a business. Host that for $10/month. And Exchange should not be in-house if you can't repel an attack in real time. That leaves file sharing, remote access, backup, and getting to the QuickBooks data. If you need those functions, and that's what we got here, then the match seems perfect. One more note that might sting a bit: You can't charge $225/hour to service this machine. If a higher skill set is not required, clients are not likely to pay for it. But that's worst case. I'm sure we won't find this server filled with such blatant direct-to-end-user sales. After all, Microsoft is totally committed to the channel.